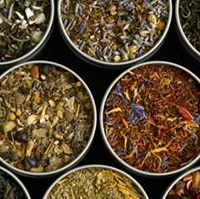 If you are an avid herb grower, the best way to preserve your herbs by far is to dry them. Drying herbs is a common question that surprisingly few people can answer outright. 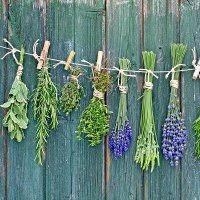 There are several methods you can use for drying herbs that are fairly easy to do, and we will discuss a few of those drying methods here. Harvesting: Before we discuss drying herbs, you first need to know when the right time is to harvest them. It is believed that the very best harvesting time for most of the herbs one might grow, is during the bud stage, right before the flowers are ready to open. It is said most herbs are at their most flavorful at this point. The best time of the day to harvest is in the morning when the dew has had a chance to evaporate. This will give you the best chance to avoid having the leaves wilt. You will also want to be very careful that you don’t handle the leaves too roughly and risk bruising them. Rinse all the herbs you have harvested in cool water and make sure to give them a gentle shake so that any excess water will be removed. We are drying herbs after all, we don’t want to start off with them soaking wet. During this step, you can take the time to remove and of the leaves that have been damaged or are otherwise imperfect. Be sure not to let the harvested herbs sit in direct sunlight or they could be ruined. 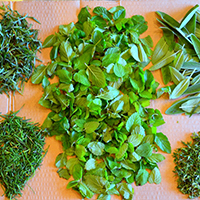 Once this step is complete, you are ready to start learning how to dry herbs. 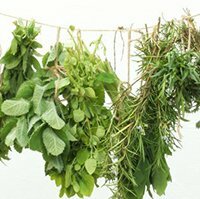 Drying Methods: There are several different methods you could choose from when learning how to dry herbs, all of which will get the job done if performed properly. The real decision you have is how much work you want to do and if you are willing to invest any money in equipment to do the job for you. At its simplest level, drying herbs is just a matter of putting the herbs into an area that is well ventilated with dry, warm air, until all the moisture in the leaves has evaporated. If you live in a dry climate like the southwestern United States, then you have a much easier time of this process. If you live in a humid area, you have to do a little more work to get the same results. The process on drying herbs is roughly the same either way. Dehydrator: When many people think about how to dry herbs, they think of dehydrators. Dehydrators are a fast and extremely easy method of drying herbs because they give you the ability to accurately control the temperature and also the air circulation. As a general rule of thumb, you will want to pre-heat your dehydrator to a temperature between 95 to 115 degrees, or as much as 125 degrees if you are in an area with high humidity levels. Lay the herbs out, taking care not to overlap them as much as possible for efficient drying. Drying times will vary significantly depending on humidity and moisture level of the herbs, but you can figure roughly 1-4 hours for most leaves. When the leaves turn crumbly, they are sufficiently dried. For most specific instructions, you can try looking in the user manual for your dehydrator. Many models come with instruction on drying herbs. Hanging: Before technology became predominant, early peoples learned how to dry herbs for centuries simply by hanging them in a warm and dry location until the moisture evaporated from the leaves. While this is not as controlled of a process, it is no less an effective way of drying herbs. 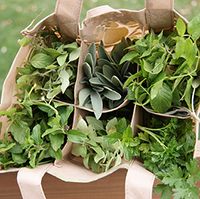 You can tie the herbs in small groupings and hang them, or you can “bag” them to catch any falling leaves or seed. Just use a plain brown paper bag and punch a few holes in the sides to allow air to circulate through it, then close off the open part of the bag with a rubber band. Hang the bags in a location that get plenty of air moving through it. The purpose of the bag is to catch any seeds or leaves that might fall off during the drying process. Leaf Drying: Sometimes drying the leaves by themselves is better than trying to dry out entire stems, especially in high humidity locations. This is especially true with herbs such as sage, mint, or bay leaves. When drying herbs this way, it is best to choose the best leaves from the herb bunches for optimum results. Paper towels work great for this process. Lay out your leaves on the first paper towel, making sure none of the leaves are touching each other. Cover the first layer of leaves with another paper towel, and lay out another layer of leaves. You can repeat this process several times, but you shouldn't do more than five layers of leaves or else they may not dry properly. You can use your oven for drying, but do not turn it on. With electric ranges, the light inside the oven provides enough heat to dry your herbs overnight. If you have a gas oven, the pilot light will be sufficient. Microwaves: Yet another interesting method on how to dry herbs is using your microwave oven. While microwaves are only good for small amounts of herbs, many models actually have specific instructions for this process in the user manual. Consult yours to see if your microwave has the capability too! Your herbs will be properly dried when the leaves turn crumbly when rubbed between your fingers. At this point you will want to seal up your herbs in airtight containers and store them in a cool, dark area for prolonged storage. Enjoy!